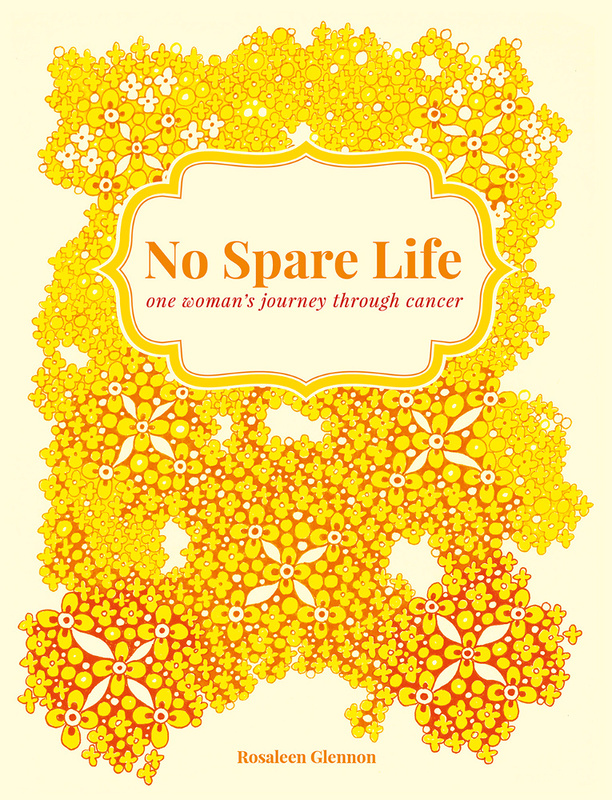 Many thanks to the Northside People (east) newspaper for featuring No Spare Life: one woman’s journey through cancer as their “Book Of The Week” in their May 24th edition. If the scanned image here isn’t clear enough you can also read it online. 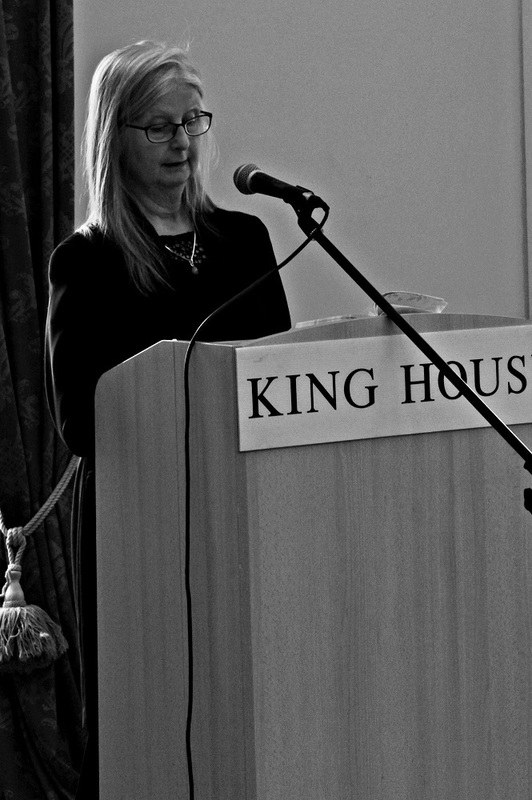 Sligo Book Launch – thank you! I would like to say a big thank you to the people (some of whom I knew and some I met for the first time) who attended the book launch in Sligo on Saturday 25th March. It was a beautiful day weather wise so I really appreciate people coming along. The Banking Hall in the Yeats Memorial Building was full of atmosphere as at the moment it is hosting the Yeats exhibition. I read these pieces from my book, No Spare Life: In the Beginning, Marionette Days, Skin Cover and Grace Notes which was accompanied by Klaus Harder on the guitar and is a good piece to finish on. You are cordially invited to the Sligo launch of Rosaleen Glennon’s book No Spare Life: one woman’s journey through cancer. Sat. 25th March 2.00p.m. – 4.30p.m. King House, Boyle, Co. Roscommon. I launched my book No Spare Life: one woman’s journey through cancer in the Irish Writer’s Centre in Dublin on the 10th Dec. last. It was a day I will hold close to my heart. A day I wasn’t sure I would see. My family turned out in force and some friends I hadn’t seen for some time. Thank you everybody for making it such a memorable day. A celebration. time is precious and I don’t anymore. You rarely see actual notes nowadays. biscuit tin. I still have it, full of treasure. of my mother’s granny print apron in it. Now I listen to my own gut which is much happier. I used to be a child. Some days I can still sulk. but it’s all bad stuff. The beautiful simple, seeing otters at the lake, isn’t news. It took a year to accept this “new lookˮ. Wouldn’t that be shocking funny? I rolled back onto the bed and laughed. I used to be busy dying now I’m busy living. resting at the base of the spruce tree. I stop what I am doing and watch for a while. It’s there again today – Light. though it may have been borne of uncertainty. and tie it together with golden heart strings. for they are the other half of our story. to take each step we need to take as it comes. the bigger picture or the future outcome. Look at the shoulders of the person in front of you. and let the light into their lives. Urge them to rekindle dreams, create new ones. stop what you are doing and watch for a while. Performed at Light the Night, A Ceremony of Light & Hope, The Cathedral of the Immaculate Conception, Sligo. 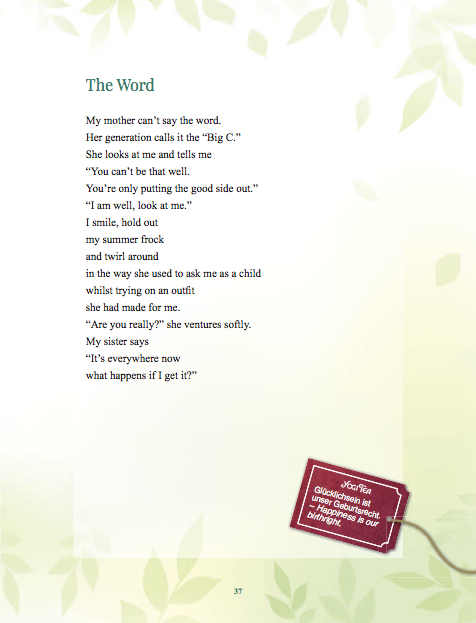 My mother can’t say the word. “You can’t be that well. she had made for me. “Are you really?” she ventures softly.